Ashley Wood is an Australian artist most recognized for his Spawn comic book cover paintings, Hellspawn comic illustration work, Metal Gear Solid art, and Tank-Girl work. More recently he has spent a great deal of time on his original properties Zombies vs. Robots (vs. Amazons), Popbot, World War Robot, and the newest, Adventure Kartel, working with ThreeZero toys of Hong Kong to form the toy-making partnership ThreeA, through which Ashley’s original designs come to life. ThreeA toys are most recognizable by their incredible detail and weathered paintwork. 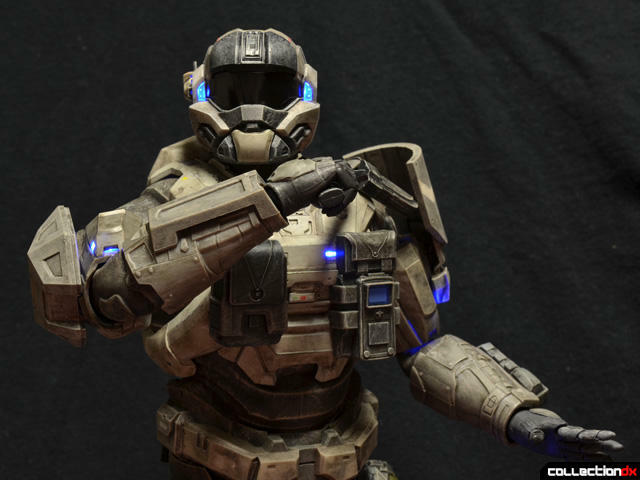 Halo is a long-running videogame franchise featuring genetically modified Spartan super soldiers in tricked-out space marine battle armor that has been just BEGGING for high-end toys for a while now. 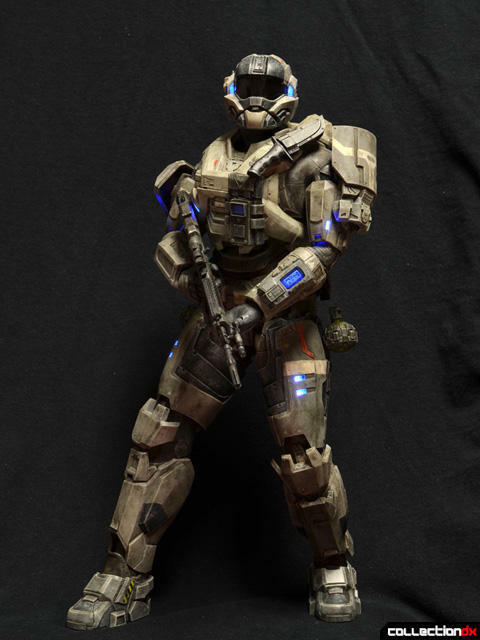 Halo: Reach was the 2010 installment of the franchise, chronicling a key event in the Halo mythology and introducing players to a variety of Spartans other than the series' protagonist, Master Chief. 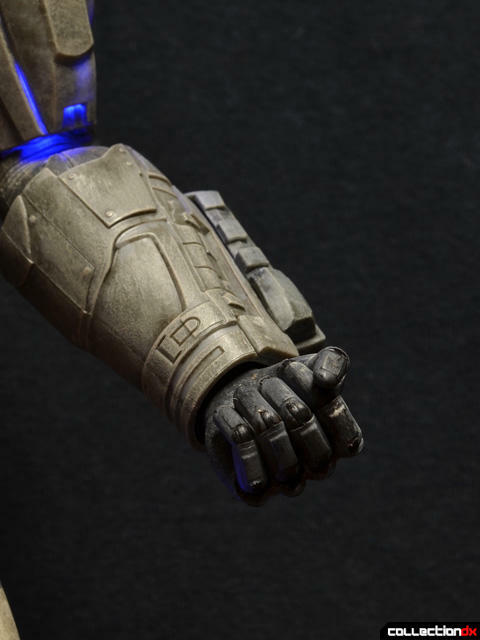 When ThreeA announced they had acquired the Halo license, I was cautiously optimistic. 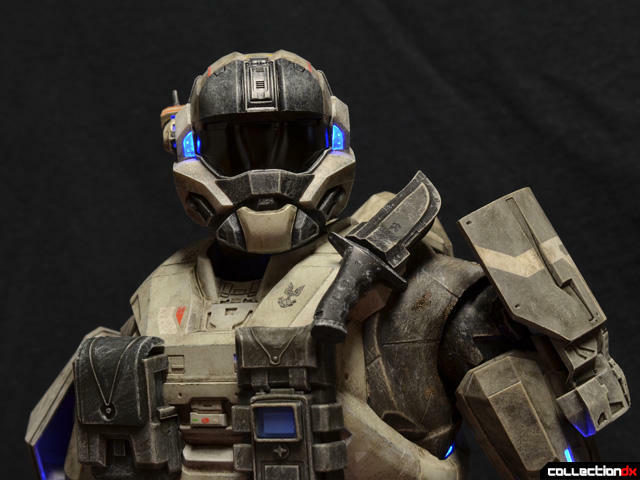 The gritty Spartan designs were perfect for toys, but considerably more detailed than the usual ThreeA fare. 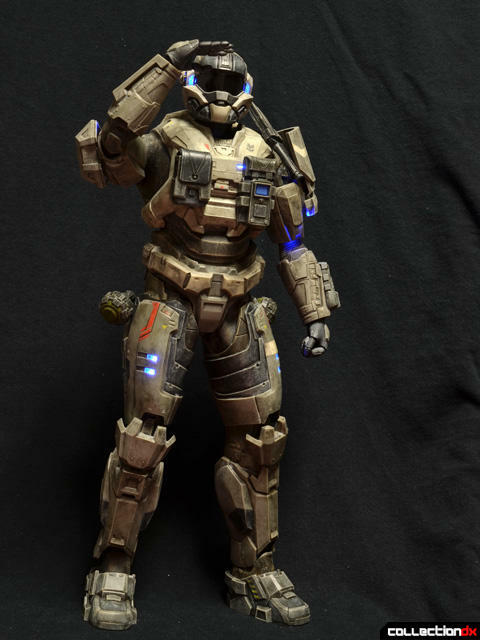 The first 3A Halo figure announced was Noble One: Carter, leader of the elite Noble Squad from Halo: Reach. Carter was available for preorder on Bambaland and is still available from regular retailers. 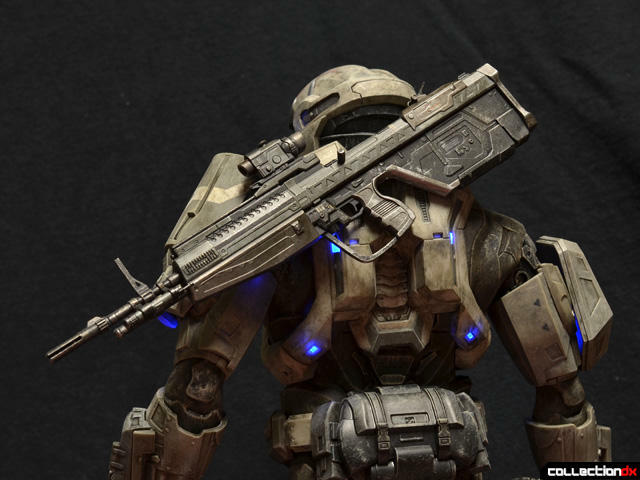 Available at the same time as the Carter direct from ThreeA was the Bambaland-exclusive Spartan MkV Commando. The Commando comes packed in a beautiful box with subtle detailing, safely encased in a vacuum tray. 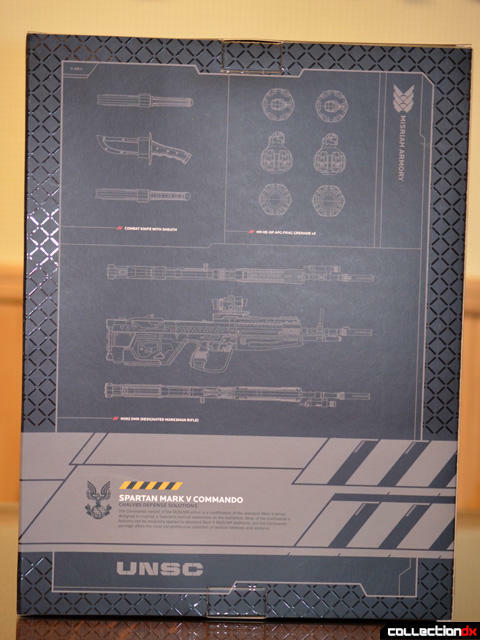 The box features nice graphics detailing the included weapons. It's a departure from the usual stark graphics and bold type of Ashley Wood's boxes, and I quite like it. Out of the box, Commando stands thirteen and a half inches tall and is fairly hefty. Much of the figure feels hollow, but there are many layers and moving parts to the construction that make it feel very detailed and robust. We've got some work to do before we can get to the meat of the review, though. There are three battery compartments to fill. The first is a large opening exposed by removing the back armor. 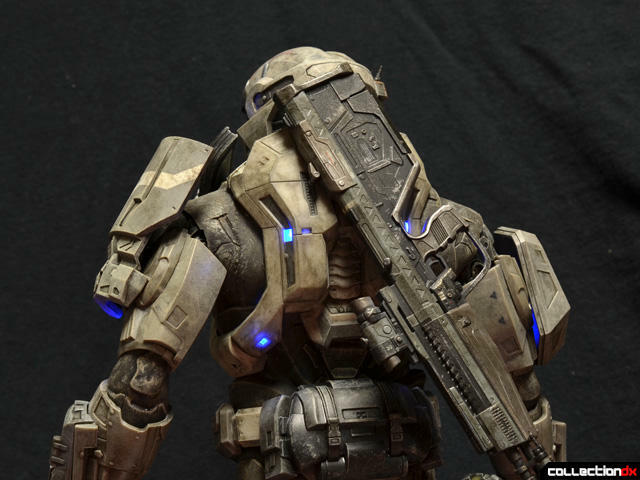 The back armor attaches securely by clips above the shoulders and on the armpit armor. One of the armpit panels was loose on mine out of the box and had to be re-glued, but nothing was actually damaged. There are also battery compartments in the backs of both biceps, with removable armor panels and battery doors secured with very small phillips head screws. Two CR2032H batteries are required for the back, and six AG4/LR626 batteries are required for the arms. Getting the tiny LR626s into the arms is a pain. 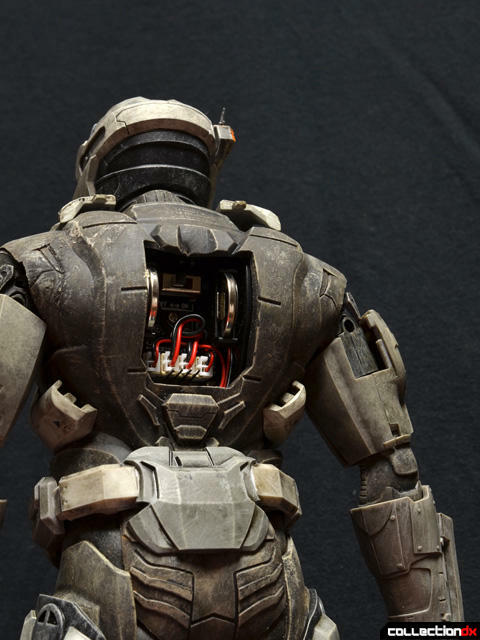 The back armor has terminals that mate up with pins in the back cavity to power the lights on the back armor. Care is needed to align the pins properly when reattaching the armor, but the plastic alignment pin helps. 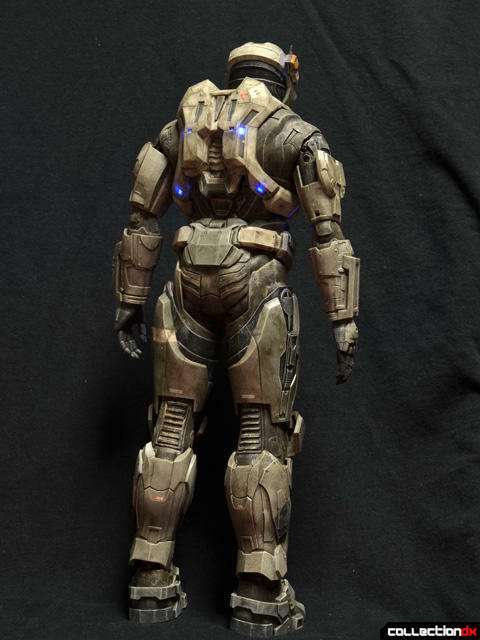 The annoying thing here is that the switch for the body lights is inside the back, so the armor plate must be removed each time to turn the lights on and off. Everything feels well made, but I worry about accidentally squishing the pins or breaking a tab over time. 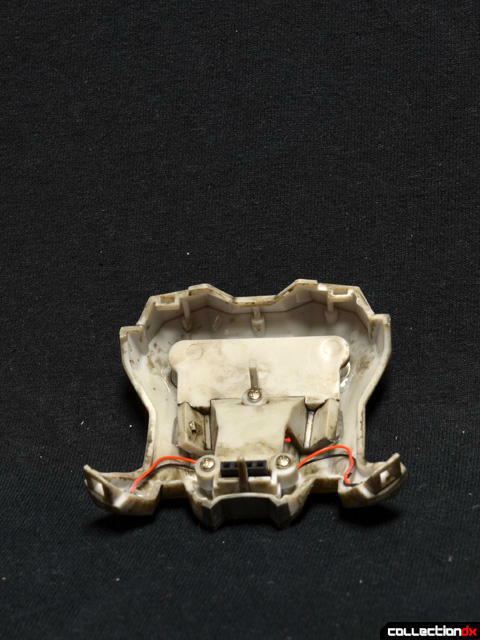 The switches for the arm lights are small and exposed like the switches on Hot Toys Iron Man figures. Turning the lights on immediately washes away my annoyance with the back compartment. 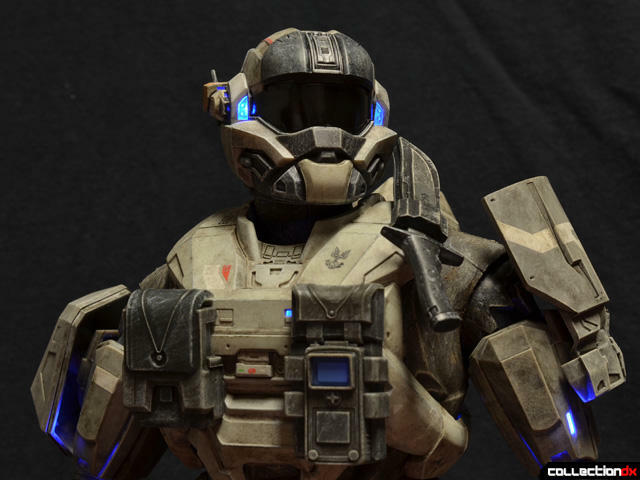 There are fiber optic light spots all over the armor that glow bright blue for a very high-tech videogame future effect. The lights on the back look good, too. There is very little light bleed around the illuminated spots, which would spoil the effect. 3A's Commando is a gorgeous figure. The details are sharp, the lights great, and the paint is much more refined and subtle than on the main line stuff. There are light washes and drybrushing that accent the raised and engraved detail perfectly, with fine decals scattered about the armor. The construction is a big part of why this figure works so well. 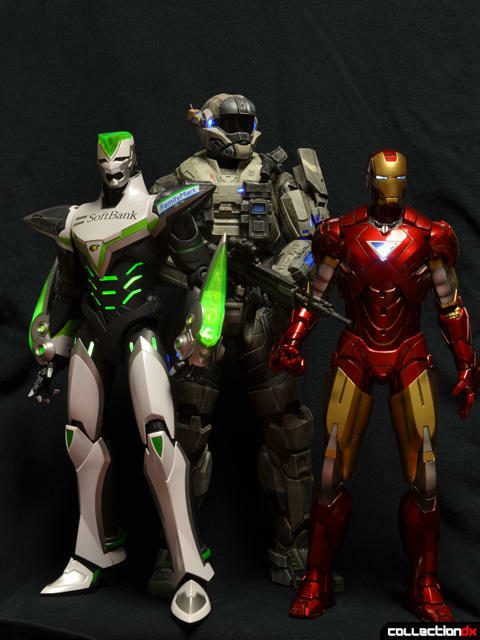 All of the armor is molded in a lightweight plastic fixed over a softer material suit. Unlike other figures with undersuits, the black suit on this guy is made from multiple parts with layers covering seams and such, allowing for maximum articulation and durability. Areas like the shoulders and hips are extremely mobile, and there is little risk of the suit stressing and getting damaged from tight poses. 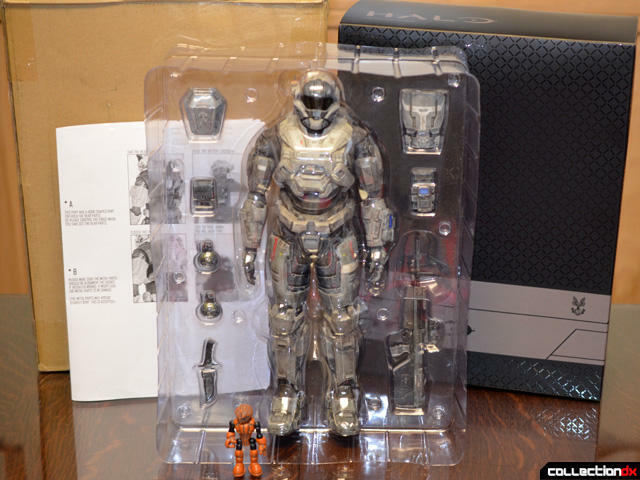 The whole assembly adds up to a very durable and realistic looking toy. Commando's hands are small marvels. Each digit is articulated, with multiple points of motion at the base of each digit for extra posability. The joints are tight and the hands feel well made, but I have heard some complaints of joints coming apart, but not actually breaking. With care, they feel like they should hold up. There are a number of small accessories included that must be attached to the armor, including the shoulder pads, a fanny pack, chest doodads, and a sweet knife with scabbard. In a surprising move, all of the accessories except for the chest gizmos are magnetic! Attachment via magnets allows for a very clean look with no small, fragile attachment points to risk breaking. All assembled Commando earns his name. 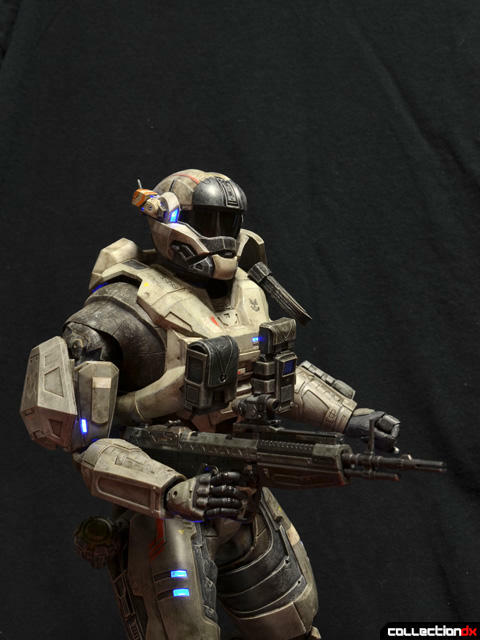 The little pouches and packs add sci-fi future soldier legitimacy, while the shoulder pads speak to that glorious customization available in Halo multiplayer. The fit of the magnetic parts is generally precise, except for the knife. There is a 'sweet spot' where the knife sits, but it is not quite as secure as some of the other parts. The shoulder pads and the fanny pack all have sculpted detail that helps them sit correctly on the armor. 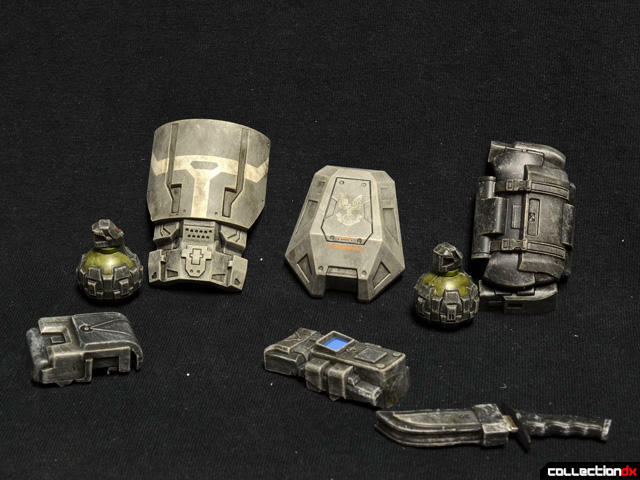 There is some play to how the grenades sit, but I think that helps them look more natural depending on the figure's pose. The magnets also allow for a little bit of customization. 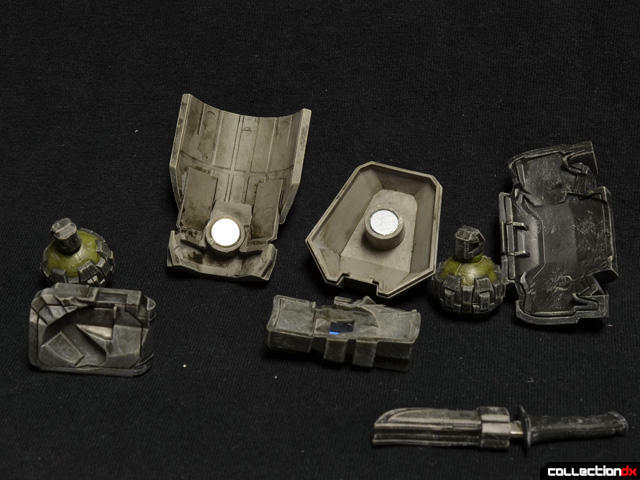 The grenades can be stuck to other magnetic hardpoints on the body and accessories, if you're into that kind of thing. 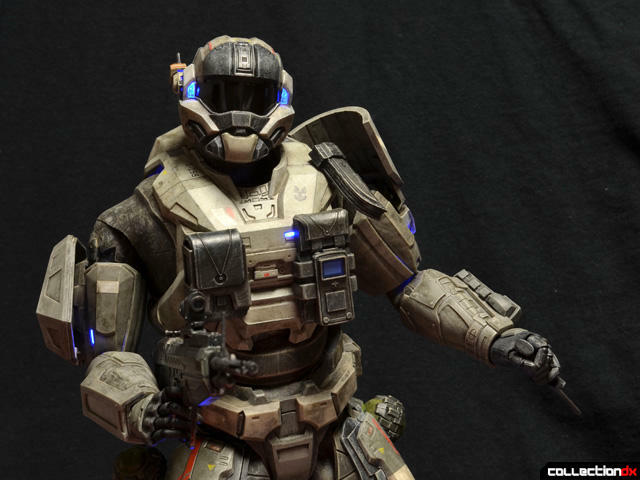 Even armed with just his knife, the Commando looks incredible. The major joints on the figure all ratchet with a satisfying click, allowing this enormous figure to hold dynamic poses firmly. The range of motion is also excellent, allowing for very natural stances for a hulking genetically modified monster in sci-fi battle armor. As I mentioned above, the scabbard for the combat blade does not attach all that securely. Without the knife in to help balance it, the scabbard spins around freely on its magnetic hardpoint. Not a huge deal, but something to watch out for. 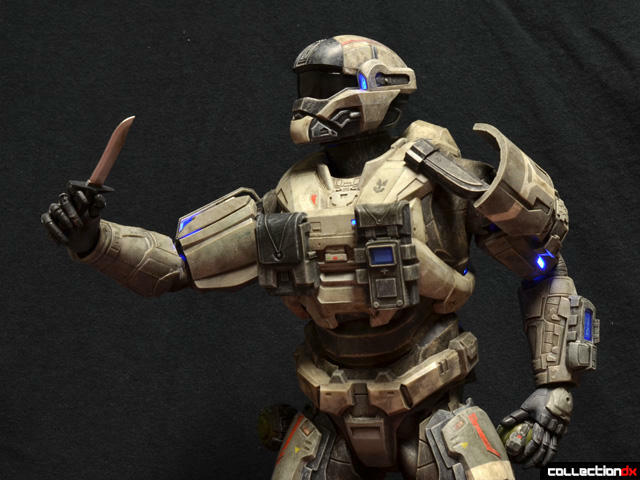 Posable hands and sharp looking combat knives are made for each other. The Designated Marksman Rifle is a gorgeous piece of future-tech weaponry. 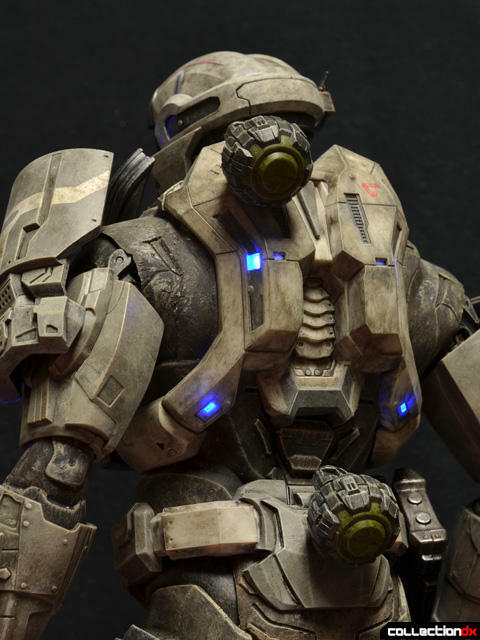 It also has two magnets in it that mate up with two magnetic points on the back armor. One magnet is a bit weaker than the other, so jarring the figure will often cause the DMR to come loose at one point and swing around. It actually still looks pretty good like this, so I am not complaining. In general the magnetic accessories are a fantastic idea that is well realized, allowing for playability without sacrificing detail. Now that we've gotten all of the gritty stuff out of the way, we can get down to what matters. 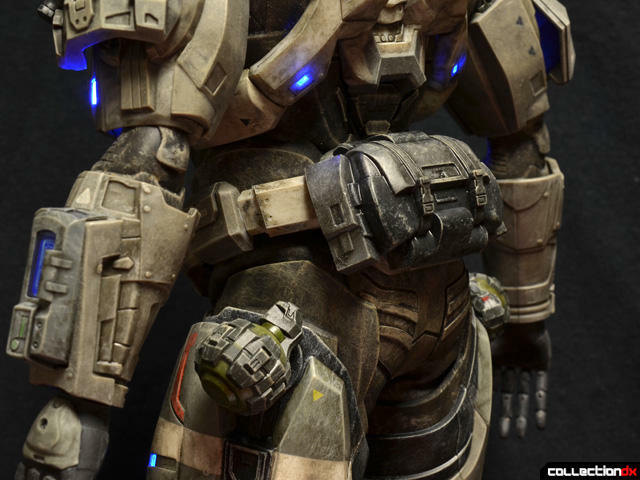 ThreeA's first Halo figure is completely amazing. I have nothing but gushy love for this figure. The detail is incredible and the smart design allows for it to still be an incredible satisfying toy that can be handled and holds cool poses. He's just fun to mess around with. The articulation allows for a variety of cool poses within the limitations of the armor and accessories. 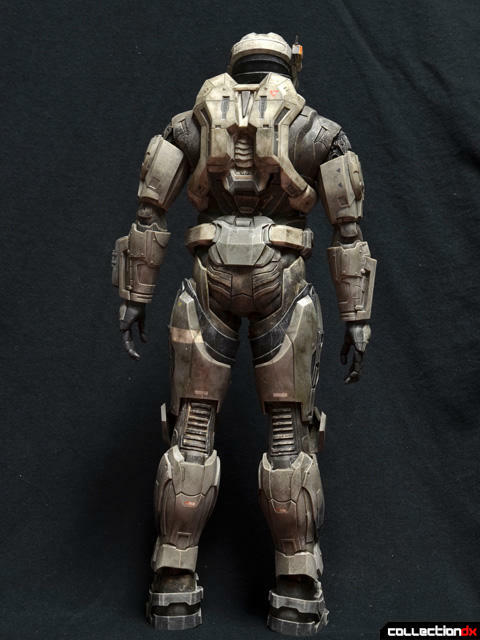 ThreeA's sculpt is bulky in all the right places and mobile enough to capture what Bungie's designers were going for with Halo's super soldier designs. Commando looks stoic and determined no matter the pose, ready to defend humanity. Removing the right chest pouch bit allows for some great aiming down the sights poses with the DMR. Commando is not quire posable enough to look through the scope, but the scope is probably wired to the HUD view inside his helmet anyway. My Commando tends to end up firing from the hips while drawing his knife to stab some alien fools. 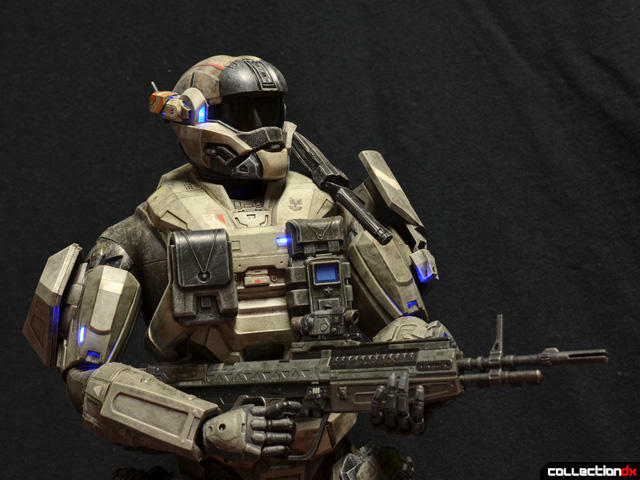 I do find myself wishing he came with the classic Halo pistol. The magnum pistol from the original Halo: Combat Evolved has something of a reputation as a death ray capable of killing anything a skilled played could see. I played a lot of Halo PC multiplayer back in the day, and I would also kill for a future release in 3A's Halo line to come with the Halo: CE shotgun. That was a good videogame shotgun. 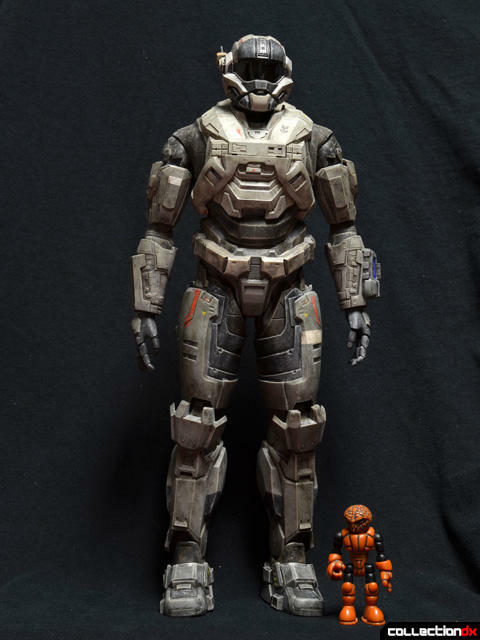 I also wanted to show off how 3A's Spartan stacks up against other 1/6 scale figures. 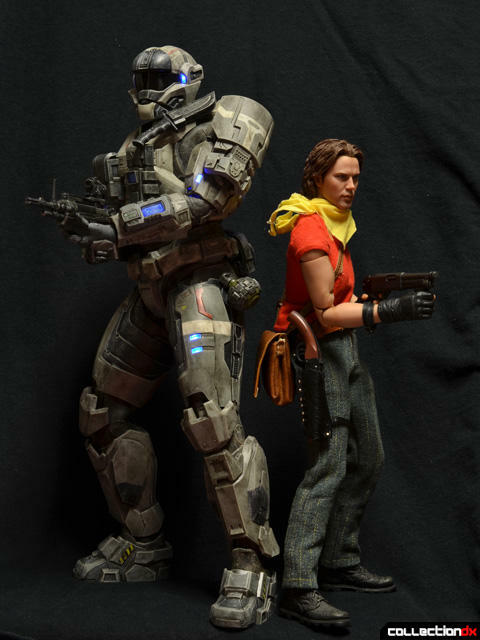 I love the fact that we live in an enlightened era where 1/6 scale figures are actually 1/6 scale and not just 12" tall. 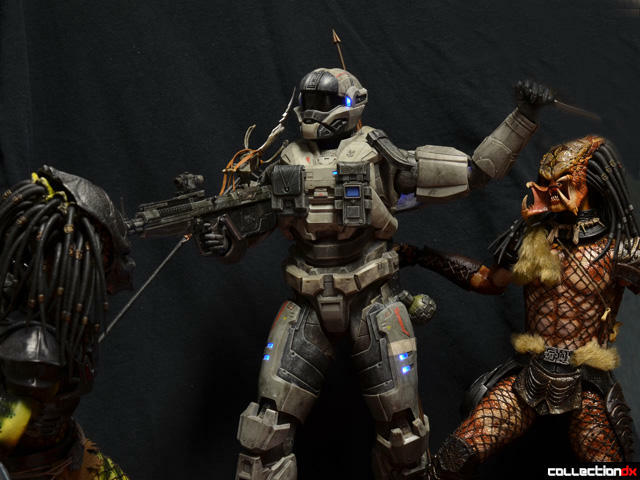 Next to a standard Hot Toys 1/6 figure, the Commando is a behemoth, as intended. 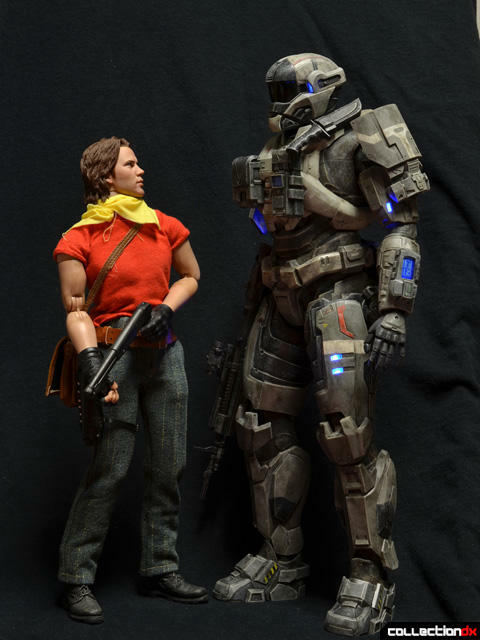 Posing the Commando with a squishy human really brings home how big and powerful the Spartan super soldiers are. 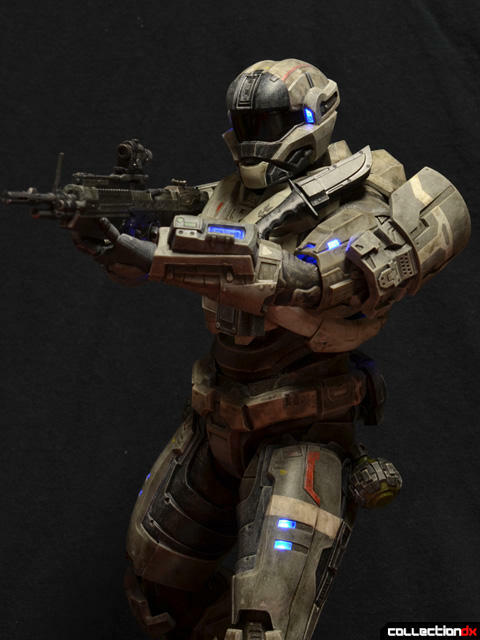 I would also love to see a rank and file USNC or ODST grunt in the line. 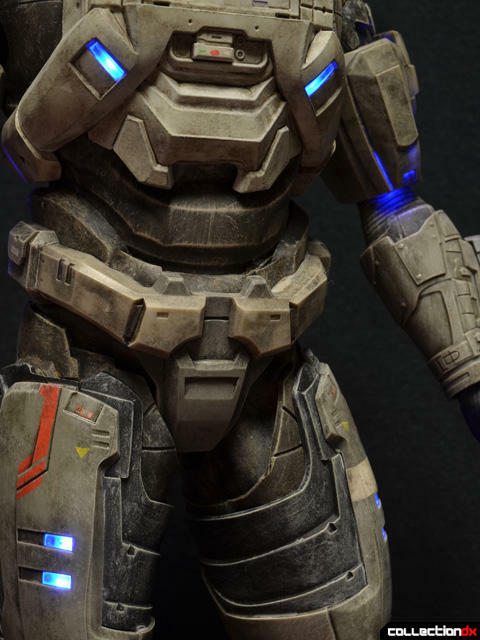 Even among other armored characters with light-up features Commando is impressive. There are few things better in life than a cross-universe meeting of armored heroes battling side by side. Where would a Halo guy review be without a view down the sights at some alien scum? 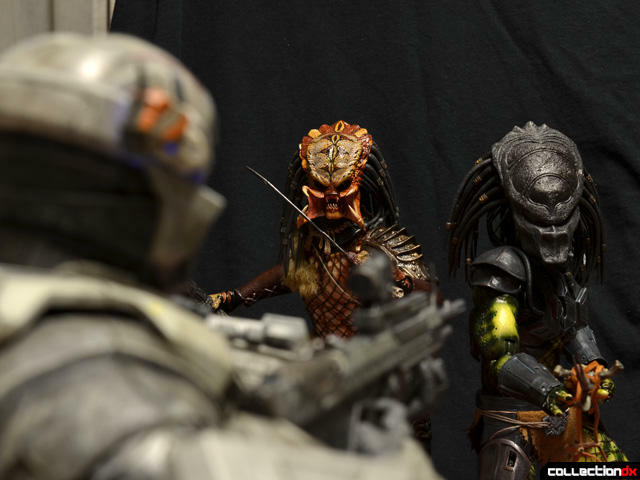 A nicely done 1/6 scale Covenant Elite would be incredible, but some Hot Toys Predators will have to do for now. I could happily spend the rest of my days pitting 1/6 scale figures from different lines against each other. 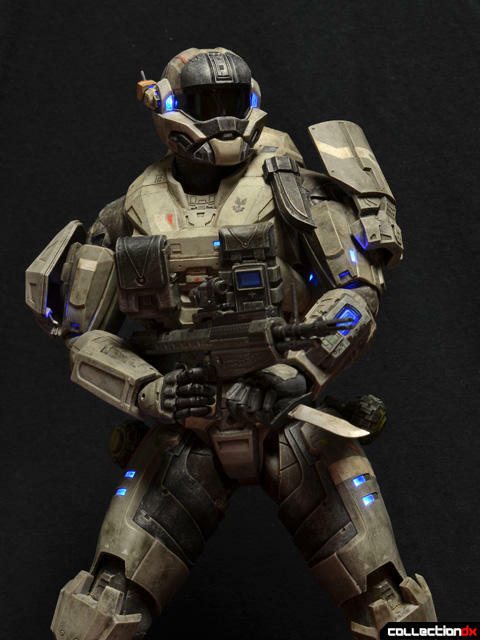 Aliens Versus Predator would have been a very different videogame franchise if the marines had been Spartan-IIIs equipped with MJOLNIR battle armor. ThreeA's Commando (and Carter) retail for $219.99. 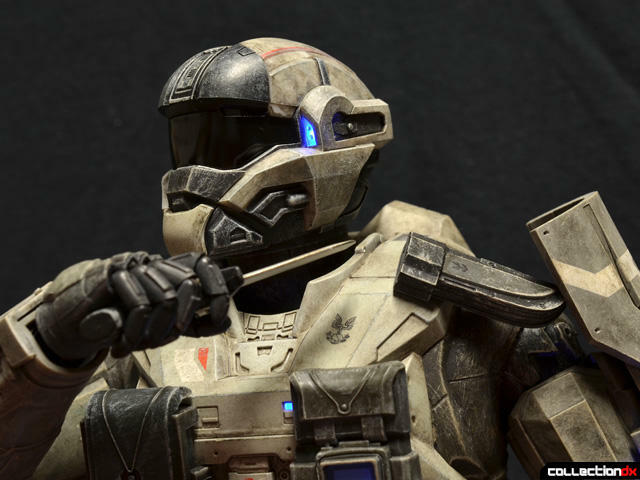 For that price you get the best Halo action figure ever made, period. 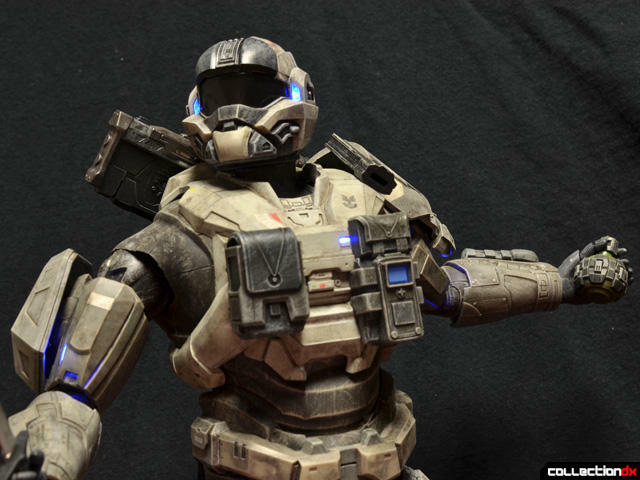 As I posted on Twitter when this guy came, any other company looking to make high-end Halo toys might as well just pack up shop. ThreeA's got this on lock. 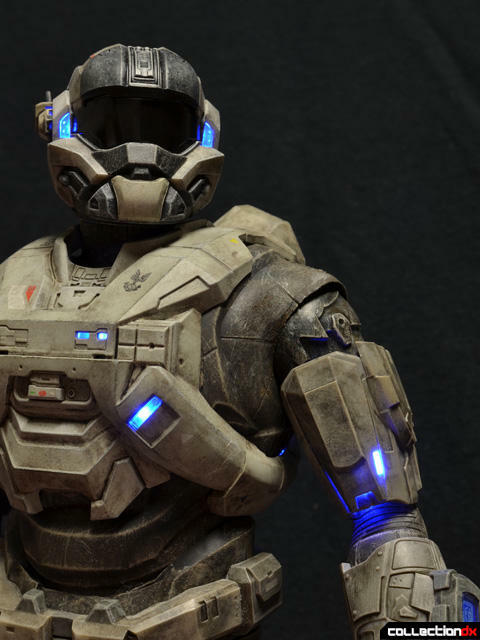 The price is more than competitive with other high-end 1/6 scale figures like Hot Toys' or Medicom releases, and the Halo guy is much larger, and in many cases far more complex. Minor quibbles with the batteries and such are easily overlooked for how impressive the complete package is. The engineering is great, and the execution is more than competent. ThreeA ahs really stepped up their game for this line, showing that they can take the right license the extra mile and produce something special. 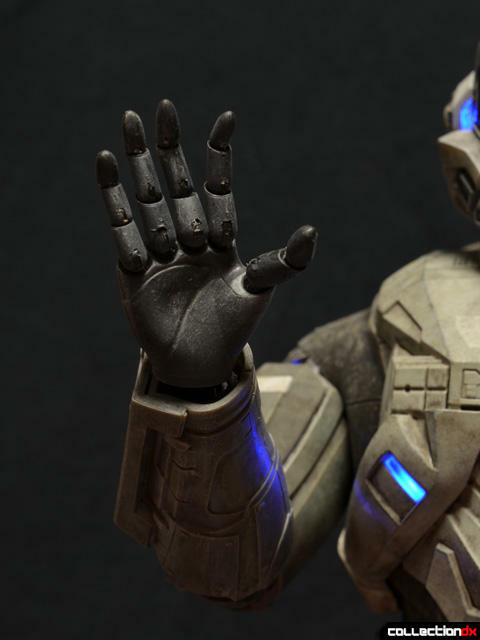 Fans of Halo, space maries, dudes in power armor, or even tokusatsu should give these a look. The Commando was a direct-order exclusive, but the regular Carter is still up for preorder from most retailers and should be shipping soon. I know I'm going to grab one. 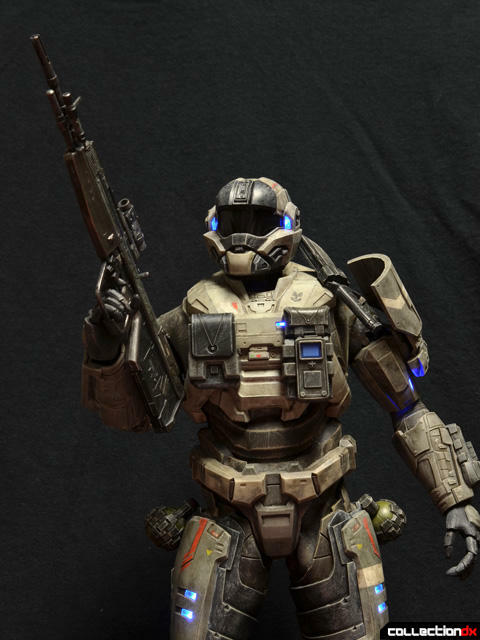 This guy is sooooo tempting, but I don't feel willing to assemble a squad at sixth scale, and I think if I picked up one tacticool Spartan I'd need at least two more. 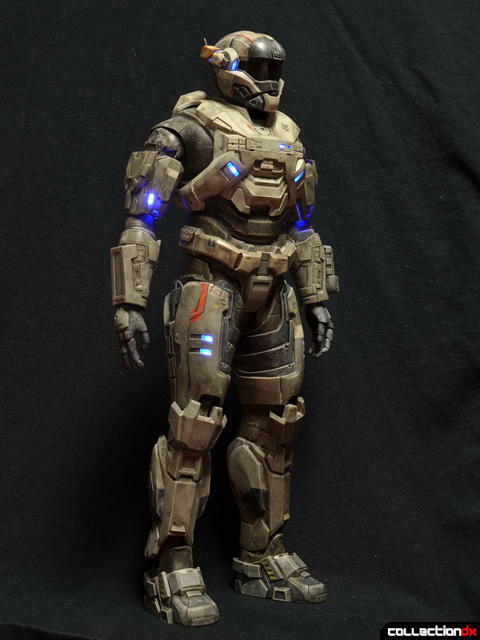 Speaking of tacticool, I really feel like this exclusive deserved more STUFF, since it's not beholden to a specific personal gear layout like the Carter figure is. It would be really amazing with paired shoulder pads, more grenades, etc. I guess some of these parts, like grenades, will be duplicated in any future releases, so you could then load one guy up with more gear. 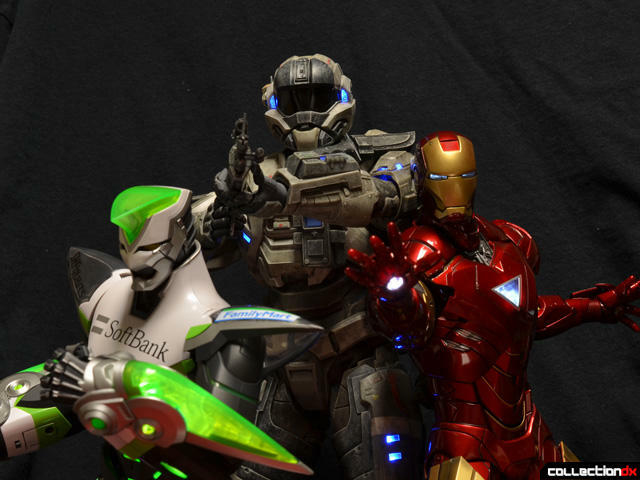 I'm hoping they do a Master Chief (preferably Halo 2 or 3 version, but I guess the weird Halo 4 redesign would be fine) at some point. 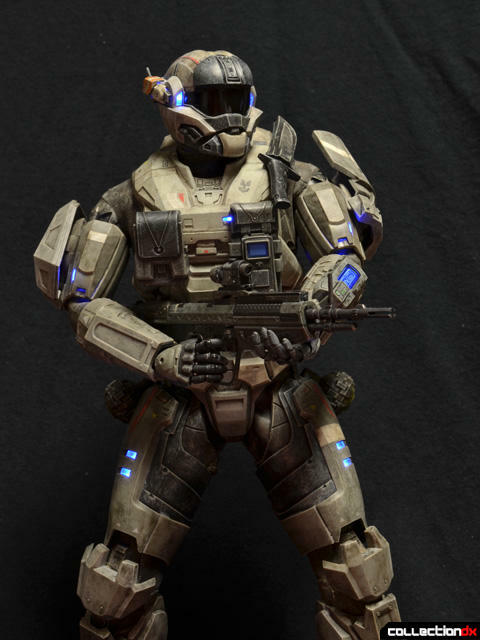 If I'm just gonna pick up one Spartan, 117 with the assault rifle and magnum would be preferable.